A Year of Being Here: Laura Grace Weldon: "Forgetting Names"
in this day’s quickening darkness. swims gratefully into open waters. as if by invisible hands. is the lifetime my soul wears. And I recall the name he wears. "Forgetting Names" by Laura Grace Weldon, from Tending. © Aldrich Press, 2013. 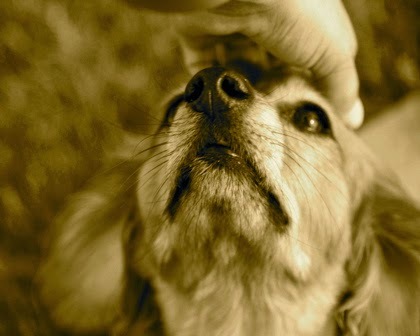 Photography credit: "ortego petting dog," by unknown child photographer, found at this link (originally color). This is just lovely, Laura. You've given such grace in place of the loss of ourselves we sometimes feel during these short memory lapses. Beautifully expressed. Thank you!